Woks absolutely great and quite simple to use ! I am impressed by your blogs and the broad technical knowledge you show. This thing seems excellent. I JSFiddled it with jQuery 2.10 and it works fine. Sure, I think that the problem is that you have not set a width on the divider. That a look at the source of http://dreamchain.com/static/split-pane/percent-vertical.html . Remember to also set the margin-right on the left component to the same value as the divider width (also see source of link above). Hi Simon – I like the plug in. Thank you very much! One thing I feel is missing is the “outline” mode that was supported in Dave Methvin’s splitter (I was using it until recently but decided to move on because it does not work with jQuery over 1.4). It allows the user to move the “zombie” divider and only resize split panes ONCE on mouseup. I work on enterprise business apps with dashboards and the issue with immediate resize is that IF the contents of the panes are large scrollable grids (fit to the pane sales orders, inventory parts, etc), the browser behavior becomes jerky when the divider is moved. Your code is very clear and I was able to make minimal modifications to it to support the outline by cloning the divider on mousedown (borrowed from Dave’s approach). However, it’s not the prettiest solution because of how the resizing math is currently packaged in createMousemove. Just a suggestion, in case you are planning to improve the plugin in the future. I don’t think there is anything lightweight of similar quality and functionality out there. Thanks for the feedback! I have also worked with visualizing large datasets, so I’m familiar with your problem. It’s a good suggestion, I will definitely consider implementing that. Can it support bootstrap responsive layout inside splitter div. Means if resize splitter by split bar then it make div responsive? That shouldn’t be a problem. Using container-fluid is probably best. One thing to keep in mind is that media queries, controlling when phone/tablet/desktop layouts are used, react on browser width not split-pane-component width. Split screen desktop view working very perfect, but not working touch screen tab and mobile. Please help me any solution. Please try version 0.5.2 and let me know if that version solved your problem. A have fixed a touch related bug in that version. Not super pretty, but you can do the following on http://dreamchain.com/static/split-pane/fixed-left.html . 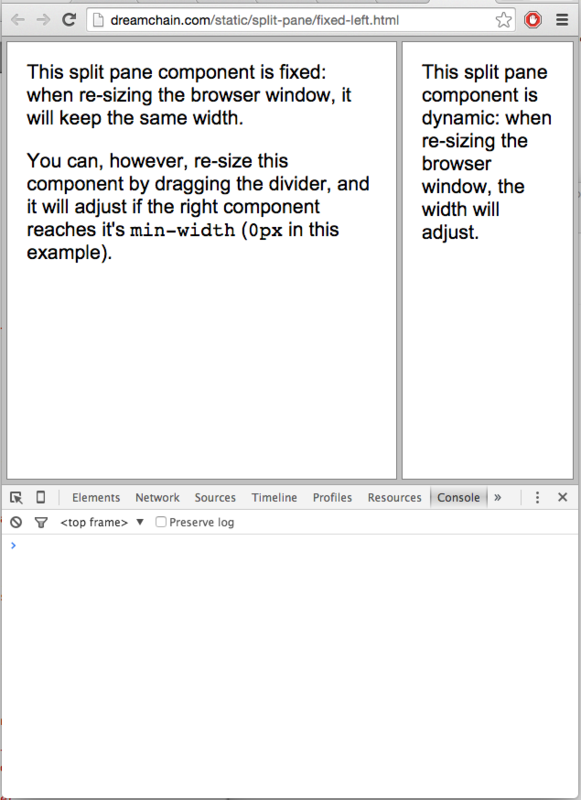 Version 0.6.0 now supports setting component size with JS. Only pixel values supported. Banner and main divs need to be position: absolute; width: 100%; left: 0. Main top = banner height. Main bottom = 0. Is it tested in Android OS? i I tried to test your example page “Vertical divider with right and left component widths in percent”. It works fine in iOS – iphone, but not worked in Android OS – tablet PC. I opened the page in Chrome and the version of android is 4.4.4. plz reply. Thank you. Can I add listener that is called after resizing. I need store these values on server – I need persist widths. Version 0.7.0 supports this. Split pane fires dividerdragstart and dividerdragend events. It’s Working Touch screen. Thank You So Much. I found your plugin to be the best of all tried, especially since it is current code, unlike some plugins that have been abandoned and no longer run on the current framework. One question: I found all functionality to fail (no panes) when JQuery Mobile js is added to the HTML file. Much of the content I need to work with has JQMobile dependencies. Did I setup my demo file incorrectly, or is there a mismatch with Split Pane when JQM is added on top of JQ, but before Split Pane? It looks like jquery mobile wraps everything inside <body> in a <div class=”ui-page”> that might break your code. to make it work with my nested example. Take a look at http://dreamchain.com/static/split-pane/with-jquery-mobile.html . Thank you so much, great piece of code, nice job! I’m using it for a webpage that will be mostly viewed on mobile devices. I tested it on my Android mobile (S5 neo, 5.1.1) with latest chrome app and it works just fine. Tested it now also with firefox and samsung browser were it does not work. The slider is highlighted but does not move. Thanks for reporting this. I’ll take a look at it. Very good plugin! Thank you, Simon! One question: can I add panes dynamically e.g – divide exist pane to two panes vertically or horizontally by some button click event? Or I will need init split-pane, add new DOM elements and after that re-init split-pane again? Yes, you should be able to add a pane dynamically. Just run $(newPane).splitPane(); on the added pane. 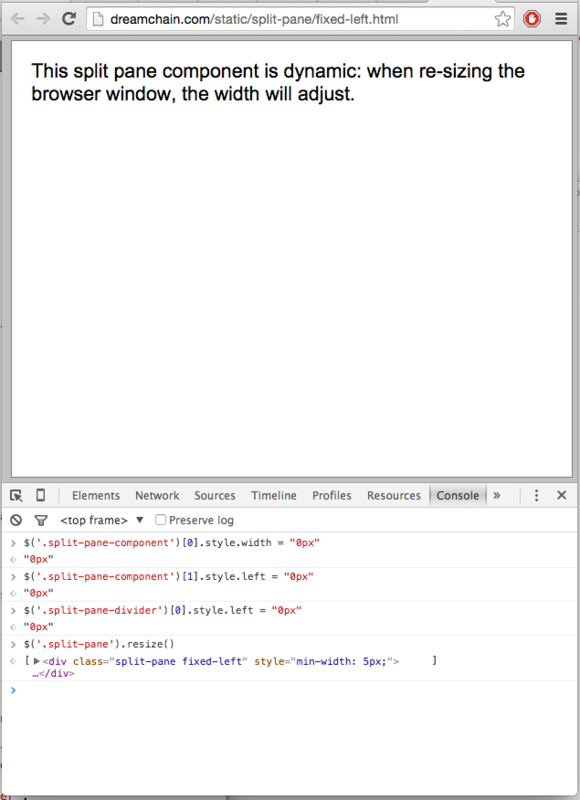 Removing a pane could work, if it’s being done using any jQuery method, for example .remove() or parent.html(”). TypeError: internalHandler is not a function. (In ‘internalHandler(event)’, ‘internalHandler’ is undefined) at line 34. I have not seen this myself. I would need to see example code demonstrating this. I’m seeing this, too. Here is some code that will reproduce it. Copy the file and execute it locally. Your html code was broken. Check out my pull request fixing your code. Is there a MAX Width property for panels? max-width is not implemented. I’ve been wanting to do that for a long time but haven’t had time yet. Disabling dragging has not been implemented either, but would make a useful feature. You would do that with nested split panes. The example http://dreamchain.com/static/split-pane/nested.html has 2 split panes in total, you would need 3 split panes. Look at how I did it in the example with 2 split panes and add a third in a similar manner. Hi Simon, is neccesary to explicit the divider divs in my html? Doesn’t your plugin add them programmatically when needed? Your code has been resolved my problem.